Taq-Klenow is modified from the full length Taq-Klenow by truncating its N-terminus, with a molecular weight of 61kDa. Compared with the regular Taq-Klenow, this truncated version is deficient in 5'->3' exonuclease activity, but is more thermostable and has higher fidelity in PCR amplification. A recombinant E. coli strain carrying the Taq-Klenow gene from the thermophilic organism Thermus Aquaticus YT-1. 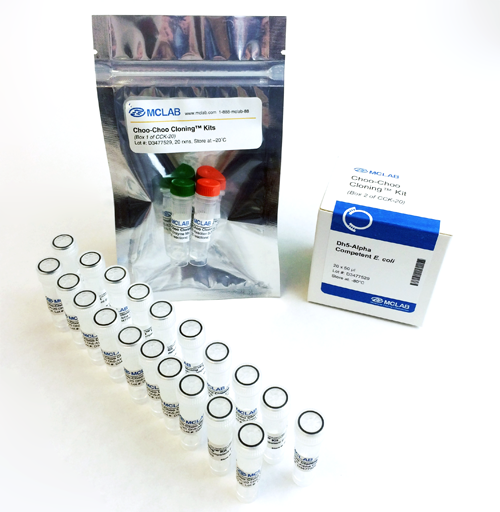 Taq-Klenow is the original and most commonly used PCR enzyme. Taq excels at amplifying shorter (<5 kb) sequences from low-complexity template sources and produces robust yields with little or no optimization of reaction conditions. Consider the following guidelines when designing PCR strategies using Taq DSC 2.0 DNA Polymerase. 4. dNTPs: Generally, a final concentration of 100-200µM dNTPs is employed, though higher concentrations may stimulate yields (particularly with longer targets) and lower may offer increases in fidelity. Taq DSC 2.0 DNA Polymerase can also incorporate and read through deoxy Uridine and Inosine, two analogs used in certain applications. 5. Taq DSC 2.0 Polymerase: 1 unit/50µL reaction (20 U/mL) is typical, though additional enzyme may be added to stimulate yields. Taq DSC 2.0 DNA Polymerase extends a DNA template at approximately 1-2000 nucleotides/minute, so it is recommended that 30-60 seconds of extension time should be provided per kb, per cycle. Appropriate extension temperatures range from 68-72°C. 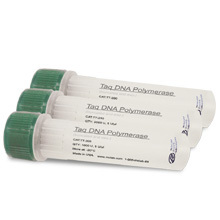 Because Taq DSC 2.0 DNA Polymerase exploits the natural affinity of a DNA polymerase for a duplex DNA fragment to promote its hot-start function, it does not require an extensive initial denaturation step to activate the polymerase.